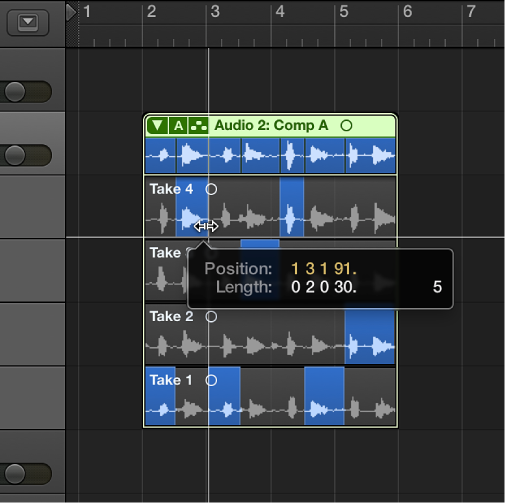 You can use quick swipe comping techniques to select the best parts from several takes, combining these parts into one master comp. After creating a comp, it’s a good idea to save it so that you can easily return to it at a later point. Any subsequent changes will automatically create a new comp. Click the Quick Swipe Comping button in the upper-left corner of the take folder, making sure it’s turned on. Click the Take Folder pop-up menu in the upper-left corner of the take folder, and make sure Quick Swipe Comping is chosen. Drag across take sections with the Pointer or Pencil tool. Selecting a section in one take automatically deselects the same section in another take. 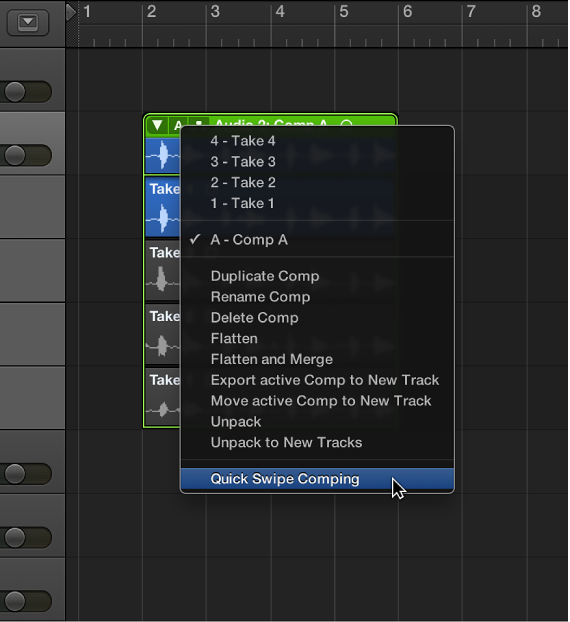 The comp sections, located in the top lane of the take folder, reflect the combined selections from all takes. 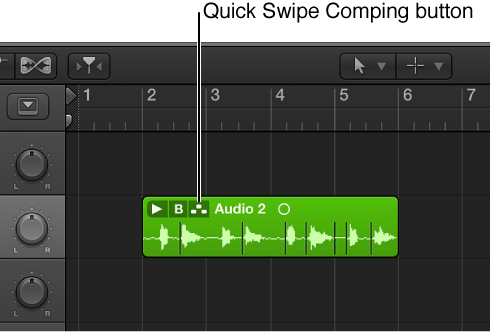 The vertical lines in the comp overview indicate the transitions between the different take sections. Choose Duplicate Comp from the Take Folder pop-up menu in the upper-left corner of the take folder. The current comp is saved, and added to the list of comps in the pop-up menu. Choose Create New Comp from the Take Folder pop-up menu in the upper-left corner of the take folder. 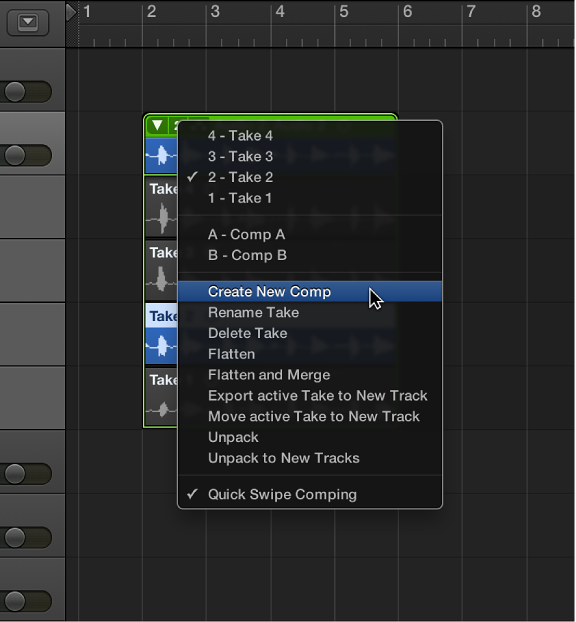 The current take is saved as a new comp named Comp X: Comp X, and is added to the list of comps in the pop-up menu. 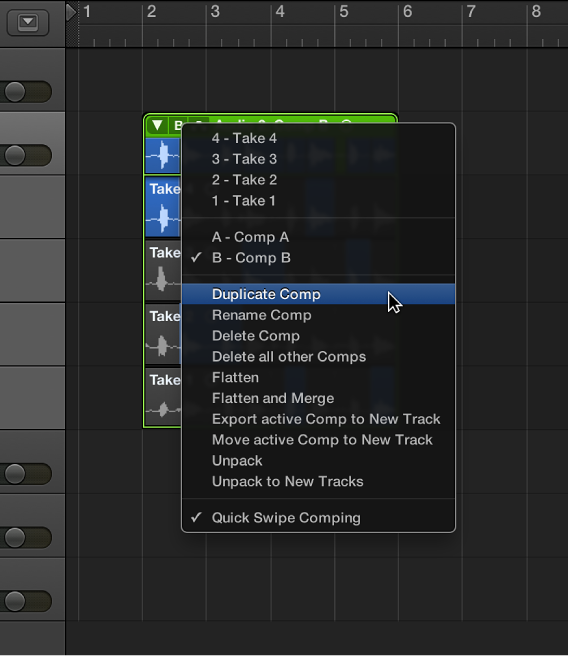 By default, new comps are saved as Comp X: Comp X, but you can also rename comps.